The preaching of the Word of God is paramount to Calvary Baptist Church. Every week, our Pastor studies diligently to bring messages that will help encourage the believer's walk with the Lord and inspire them to grow deeper in their relationship with Him. Inspirational, traditional, and Gospel music is used each week to foster an atmosphere of worship amongst the congregation. We believe that music is a powerful tool to worship God and that is seen through our adult choir, orchestra, special music groups, solos, and ensembles. Discipleship is very important to us at Calvary. We don't only want to see people come to know the Lord, but also grow in the Lord! We offer a special discipleship Sunday School class, one-on-one meetings, and at atmosphere that encourages one to get involved and experience the power of God working in their life. 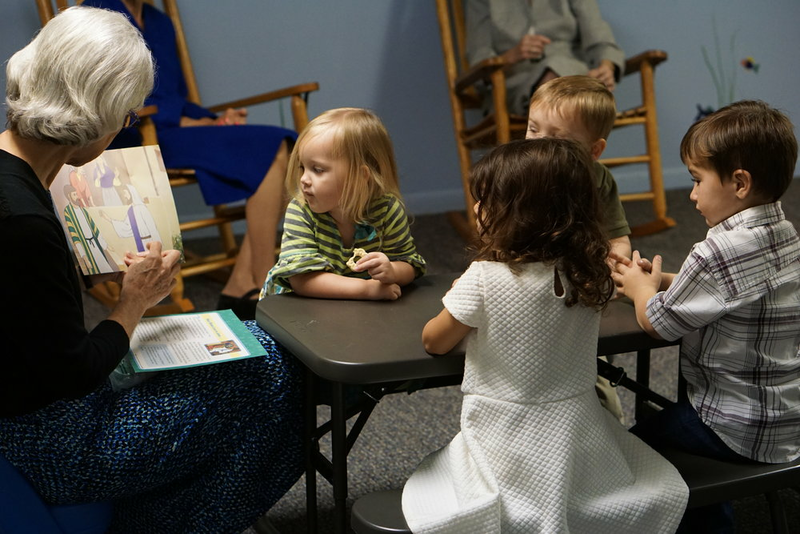 Our nursery is available for children from birth through 3 years old for every regular church service! We start instilling Scriptural truths as early as our nursery, so you can worship without worry knowing your children are in good hands. Children ages 4 through 6th grade will be part of our Junior Church for the main service time at 10:45 AM. They will learn important Bible stories and how to apply their faith to everyday life. We are proud to have a bus ministry at Calvary that has picked up children for many decades. Every Sunday morning, we start up the engines to run our routes around Lakeland. Our goal is to help children grow in the Lord and understand that victory can only be found through a loving relationship with Jesus Christ. Our AWANA Program runs each Wednesday evening (from September through mid-May) from 6:45 - 8:00 PM for children ages 3 through 6th grade. AWANA stands for Approved Workmen Are Not Ashamed and is comprised of three clubs: Cubbies (Preschool), Sparks (K-2 grade), and Truth & Training (3-6 grade). Each week, children memorize Bible verses, participate in game time, learn Bible stories, and have lots of FUN! Each Wednesday from mid-May through August from 7:00-8:00 PM, children ages 3 through 6th grade can participate in our Summer Children's Choir! From a young age children see how God's truths can be expressed through music. The lyrics they learn will help them for years to come with their walk with God. Game time is always a favorite too! CBCA was founded in 1996 as a means to provide home educated students the ability to participate in extra-curricular activities such as choir, drama, art, band, yearbook, athletics, competition, and more. We offer record-keeping, achievement testing, and a diploma with graduation ceremony. CBCA's high school music director earned his degree in music from Florida Southern College and the drama director holds her degree from Tennessee Temple University. If you or someone you know home educates their children, please visit our school site for more information! Our teen ministry starts in 7th grade through high school. We have a weekly Sunday School class, fun monthly activities, visitation opportunities, summer camp, and winter trip! We desire to train up a generation of young people that know why they love God and can take a stand for Christ in the culture and times we live. After high school and before getting married, this group finds time to meet for fun activities such as river boat trips, meals after church, bowling, and more. Sunday School lessons teach applicable truths to stand fast on God's Word in the midst of this changing culture that encourages compromise and political correctness. We are excited to offer a “M.O.M.S.” support group, which stands for Making Our Mothering Significant. Occasional activities are hosted for exciting, uplifting meetings for moms in any stage of life to get together for a time of learning lessons on a variety of topics, laughing over the crazy, stressful antics of home, and leaning on one another for support. We believe God has created marriage as the cornerstone of the family and that the family is the institution where discipleship begins. As a result, our Young Marrieds' Class seeks to equip young couples to discover God’s blueprint for marriage as revealed in His Word. From campfires to barbeques, this group enjoys fun fellowship and times of helping each other. In the midst of life's busyness, it's important for families to keep Christ first when making their priority lists. We encourage parents to have daily devotions with their children to experience a Spirit-filled life despite the many chores of the day. In class we seek to cover topics such as parenting, marriage relationship roles, personal sanctification, edification and outreach. Our goal is to equip each class member with the spiritual foundation to grow deeper in their walk with the Lord, to learn how His Word applies to their daily lives and to be all that God has called them to be, as Christians, as spouses and as parents. We offer a weekly addiction/discipleship program on Fridays at 7:00 PM. No matter what kind of addiction you or a loved one may be facing, we teach freedom is possible through a personal walk with Christ. For more information, visit www.reformu.com or contact us at office@calvaryonline.com. If you know someone who is more fluent in Spanish than English, Pastor Mendoza and the Iglesia Bautista Ebenezer Church meet every Sunday and Wednesday on our premises. Sunday School is at 12:30 PM and the main service is at 1:30 PM. On Wednesday they meet at 6:30 PM offering a preaching service, youth study, and the children join Calvary's AWANA Program. O.A.S.I.S. stands for Older Adults Sharing in Service and is our ministry to those 50 or older. We want to be about our Father's business sharing in service toward others and fellowship with each other. Meeting primarily on Thursdays throughout the year, we have sweet times of fellowship, great meals and exciting day trips. Sessions include a time of devotions and prayer. We offer several classes that meet each Sunday morning at 9:45 AM for teaching from the Word of God that will inspire you to be all you can be for His glory. God's will is not complete in our life until He takes us home. Every Sunday morning after church, our Senior Singles meet at a local restaurant for some great food and lots of laughs! The Joyful Hearts are widows that are dedicated to encouraging other widows through their grief. They stay active around Calvary by helping encourage others with prayer, cards, and visits. We have a food bank that can help to provide them with some frozen food and pantry supplies. They also are committed to visiting the church senior citizens that are incapacitated by old age or other medical circumstances. This includes visits to the hospital and nursing facilities.